Cathy’s sharp eyes and years of experience spotted 2 special finds in amongst the midden debris of bones, shells and clag- a simple copper alloy finger ring and a bone pin with a head decorated with cross-hatching. 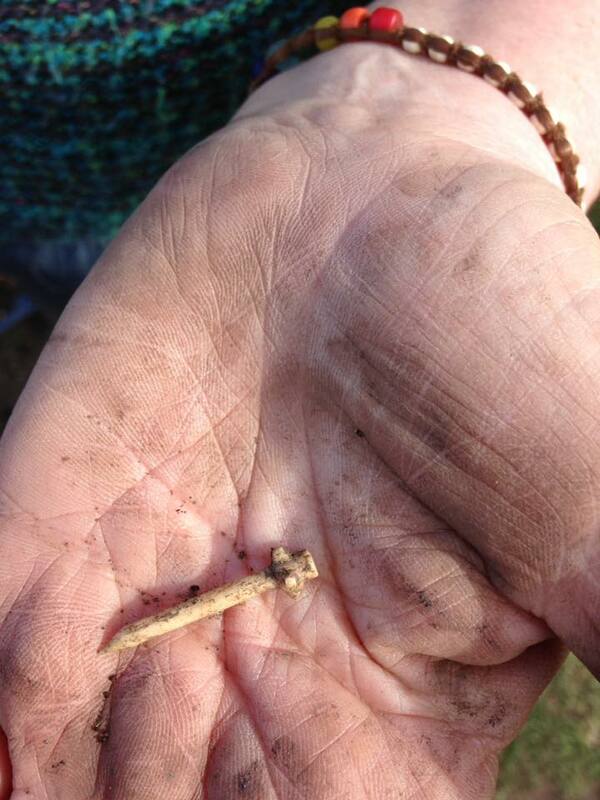 The bone pin found by Cathy (photo Northern Picts). 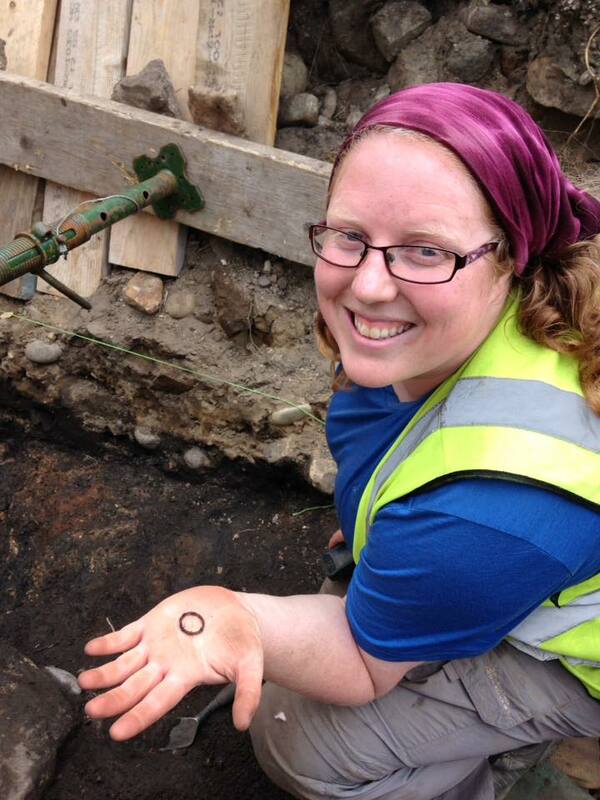 Later, another volunteer found a second mace-headed bone pin whilst sieving Cathy’s spoil. These bone pins are comparable to 7th- 9th AD pins from the Brough of Birsay and Whithorn. 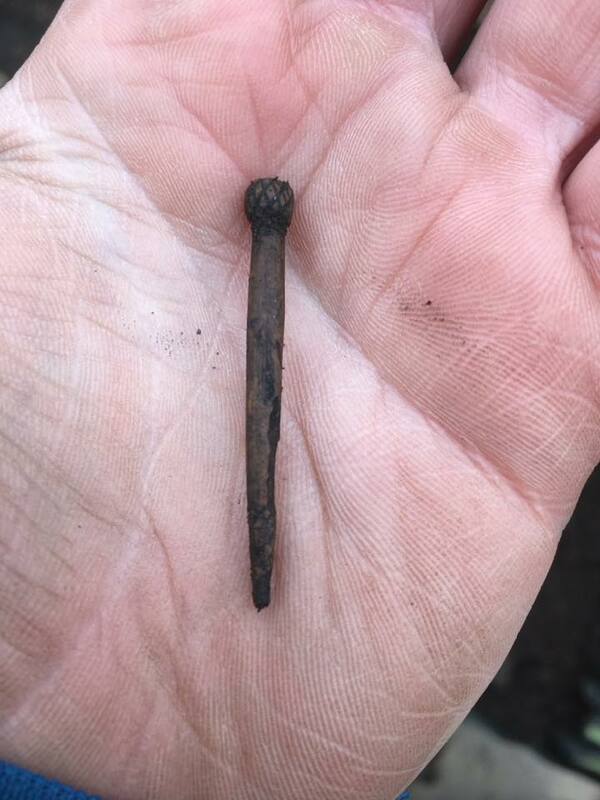 The second bone pin (photo Northern Picts). The second excavation into the rampart wall was on the upper level overlooking the sea. The grassy bank is all that is visible of the previously 8m thick wall. Now the shoreline is directly below this and it’s amazing to think how much the coastline has changed since the time of occupation. We had barely been aware of the two diggers who seemed to keep themselves isolated in their lofty, upper level until they announced they’d found a dog skeleton. Intrigued we clambered up to take a look. Sticking out from the trench wall was the front of the dog’s head with all its teeth bared. A bit grisly looking, our bone expert was very confident it was a recent addition to the headland. For a novice digger like me it was interesting to identify the cut of the pit in the section which A poor, deceased ‘Fido’. This trench became more interesting as it went down. Stonework and burnt timber was uncovered. Excitement grew that an undamaged section of the inner wall might be found. In order to safely deepen the trench it also needed to be widened. Enter team Hancock. We were to be ‘promoted’ to the upper level! I might have felt more privileged if there hadn’t been a strong wind blowing from the west which was resulting in sandstorm-type conditions I was a bit more familiar with in my previous life in Saudi Arabia. In true Middle East style I wrapped my head up in a scarf and begun to attack the tumble of stones and rubble. 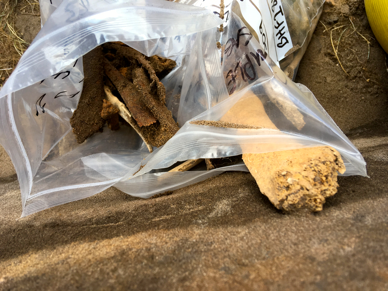 The layer of sand that was building up on the tarpaulin for our spoil made sense of the layers of sandy soil we had dug through in the trenches on the lower level. Looking across the bay to Findhorn we were reminded of the 2 previous villages which had to be abandoned because of severe sandstorms which had buried them. Had the previous occupants of the fort also had to suffer the unpleasantness and inconvenience of sandstorms? I always find when digging I begin not just to try to make sense of what I see before me but to wonder about exactly what the landscape was like and how this would impact on the inhabitants of the time. By now I was so sandy it wasn’t bothering me anymore. 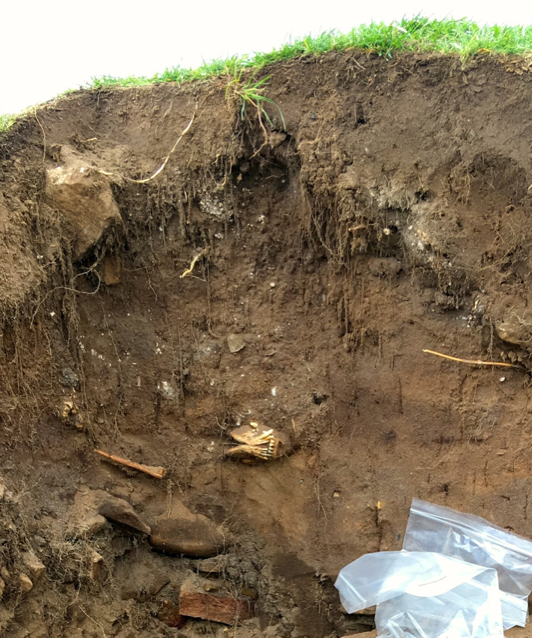 As we dug down we created our own sheltered space out of the wind and we begun to find bones- lots of them, including a mandible. They appeared this time to be more in keeping with the occupation layer and as far as we could tell they were cattle. 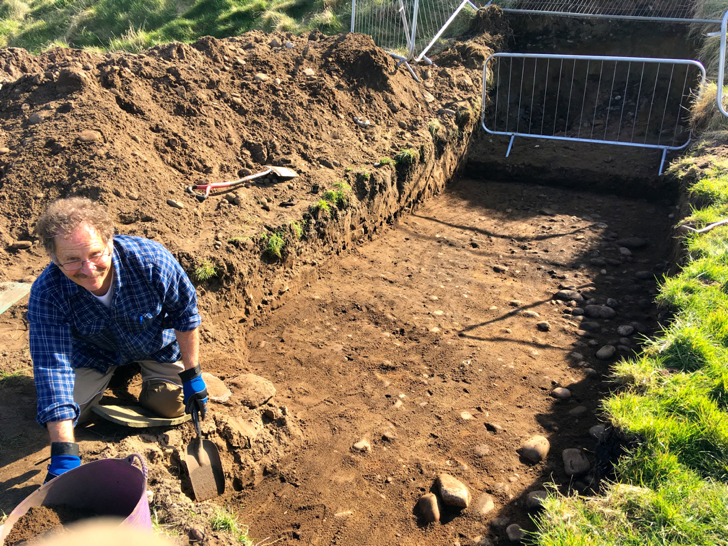 Although, the important focus of this trench was to find the inner wall of the rampart I got far more excited by my bone discoveries! Clearly, I haven’t quite moved on from an amateur ‘it’s all about the finds’ mentality! By the end of the day the ‘real’ archaeologists were rewarded with uncovering the intact inner wall face. I will not attempt to explain it but instead include the link to this fantastic 3D graphic by James of Aberdeen University. 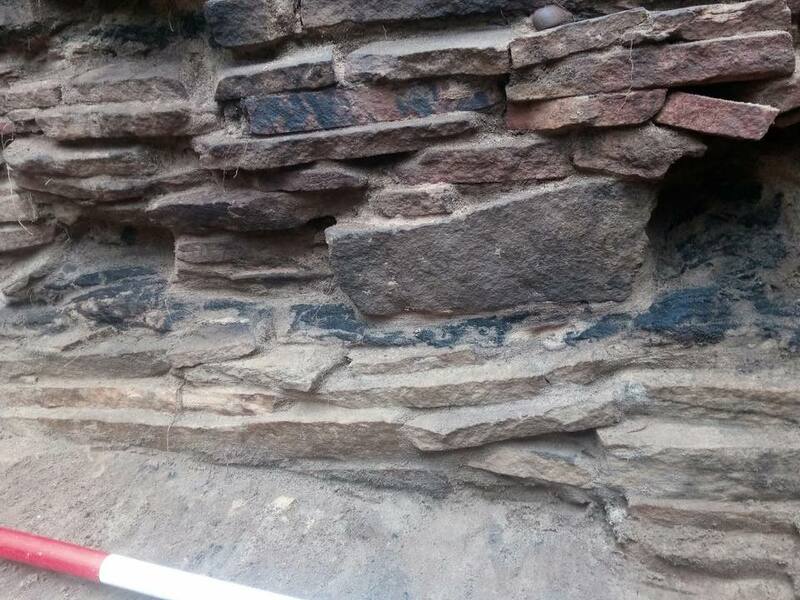 This is the remarkably intact upper citadel rampart with burnt horizontal wall timber preserved in situ in the wallface of the Pictish fort (taken from Northern Picts Facebook Page). So, after my 3 days of ‘scratching below the surface’ of Burghead I was certainly right in thinking there was more to Burghead than fishing and a good harbour. 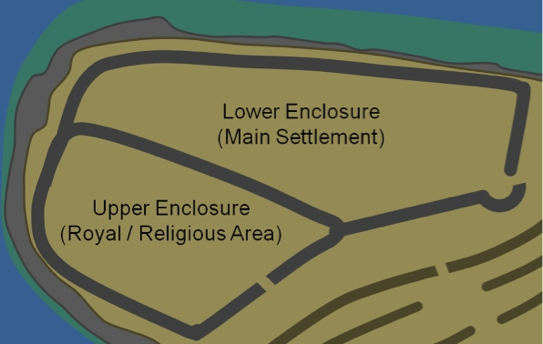 As the site of the largest known Pictish Fort in Scotland it must have once been a place of great importance.